My wishlist seems strangely cohesive this month - I'm looking for blue and white, stripes, pink and orange scarves, and metallic accessories! What are you currently wishing for? Sorry for the super short post for your Friday, my brain is just about fried out so this is all I can handle. Tonight I plan on sipping a few cocktails and trying to unwind, recharge, and forget about my gigantic to-do list, but my wedding is now just two weeks away so I'm not sure that'll happen! Hope you have a good weekend!! 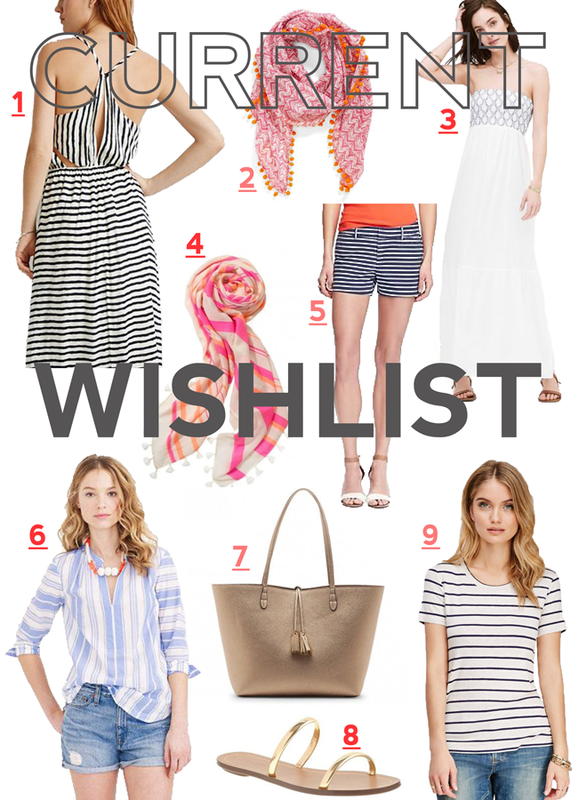 That striped linen top from J Crew is also on my wish list! It's currently in my shopping bag online just waiting to be purchased! I am right there with you - stripes & metallic accessories pretty much have a permanent place on my wish list!